So I have been really sick recently, as you can see with all the blogs dated today. However, I couldn't let my anniversary and Charlie's birthday slip by without a little something posted. We celebrated our 5 year anniversary on March 15. It wasn't the typical anniversay. We were planning to go to Spokane for Cassidy's birthday (Charlie's neice) on Saturday for the party and then Charlie's sister was going to watch the boys for the evening so we could go celebrate. Well, at 3:30am Aaron climbed into bed with us and said 'My tummy hurts," and proceded to throw up. Oh yes in the bed and all in the bathroom. So, with Aaron having the stomach flu we cancelled the Spokane trip. We ordered Outback. Charlie went and picked it up and surprised me with the iPod Touch. LOVE IT!!! We put the boys to bed and had a carpet picnic beside our fireplace. So, all in all it turned out pretty good. And for Charlie's birthday. Charlie turned 33 on March 24. He's a old man...haha. Just kidding. We ended up celebrating his birthday 2 days late. We had Chinese take out from his favorite place and a DQ ice cream cake. YUM!!! He hasn't decided on a present yet, but I'll keep you posted! We have been waiting and waiting for monster trucks to come to our area to take Aaron and finally last Saturday they did. Aaron had SOOOO much fun. Charlie took him and he said that Aaron didn't sit down the entire time. I was kind of nervous at first because of how noisey the trucks can be, but Aaron didn't seem to care. He even got to ride in the back to one during half time. He was on cloud 9 for days. 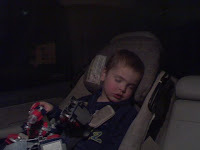 And he even fell asleep on the way home. That NEVER happens. He was all tuckered out! 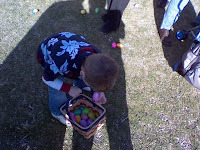 The daycare that the boys go to had an Easter Egg hunt on the Saturday before Easter. 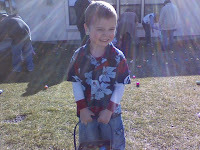 Aaron had a great time and was picking up every egg in sight. Since I had to work the entire weekend my work let me walk over the the center and watch the hunt. It was lot's of fun. 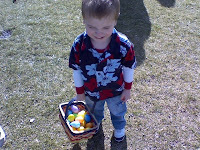 Although Aaron did not want to take a picture with the Easter bunny. Maybe next year. 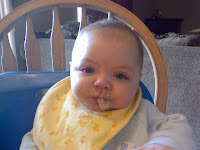 He loves his vegetables and fruits. Hope it will last. 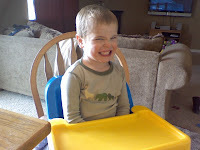 And then Aaron got jealous of Wyatt's attention and had to climb in brother's chair. Needless to say he got attention, not the kind he was thinking, but he got it. Aaron has a few friends from school that he just loves to play with are they are so close in age. One of them, Andrew, had his party a few weeks ago at Chuck E. Cheeses and they had a great time. We could hardly peel him away from the games. The best part is was that there was no clean up. Hmmm maybe I should think about that for future parties!! !